January has been a busy review month for me and this review is 11 and 12 for the month. I do believe this is a personal best for me. 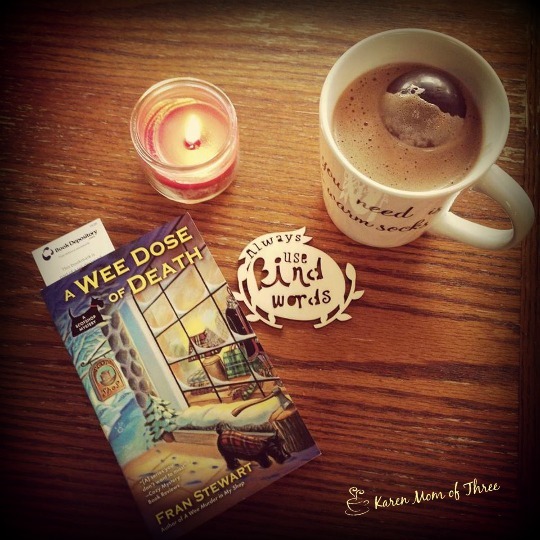 A Wee Dose of Death is the second in the Scotshop Mystery Series and is a carefully written and cleverly entangled mystery. 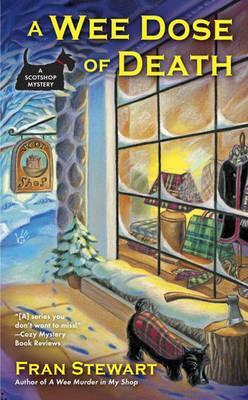 "While business is booming at the ScotShop in Hamelin, Vermont, proprietor Peggy Winn doesn t have time to toast her good fortune thanks to her hot-tempered, fourteenth-century Scottish companion. Being thrust into the modern world hasn t been easy for Dirk, but Peggy is at her wit s end trying to keep the ghostie galoot in line. But when the local police chief finds the body of Peggy s friend Karaline s college professor in a deserted mountain cabin, everyone is thrown for a loop. It seems the secretive professor may have been killed over his ecological work, an idea that s only reinforced when Karaline herself is shot. Now Peggy and Dirk must set aside their differences to put the cold-blooded killer under loch and key..."
In the end Fran Stewart left me wanting more! I guess I will have to wait for Book # 3! To order A Wee Dose of Death or to learn more about the series please click here. 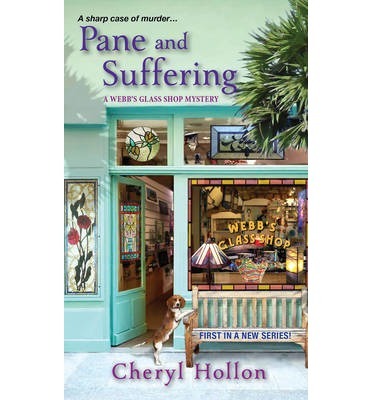 Shards of Murder by Cheryl Hollon was a first for me. I did not read book one so I felt like I was at a bit of a loss while reading this second in series. Truly my own fault as I should have started with book one Pane and Suffering. 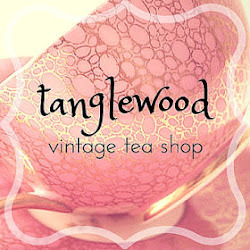 Such a wonderful title for a Glass Shop Themed Cozy don't you think! Shards of Murder is full of surprises as well. The idea of this series is intriguing and fun. This book is out February 23rd and can be ordered by clicking here. 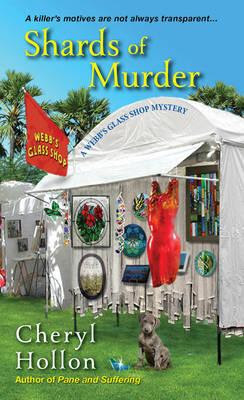 "When a glass-making competition turns deadly, glass shop owner Savannah Webb must search for a window into a criminal's mind As the new proprietor of Webb's Glass Shop, Savannah has been appointed to fill her late father's shoes as a judge for the Spinnaker Arts Festival, held in downtown St. Petersburg, Florida. With her innovative glass works, the clear winner is Megan Loyola, a student of Savannah's former mentor. But when Megan doesn't show up to accept her $25,000 award, rumors start flying. And when Savannah discovers the woman's dead body on festival grounds, the police immediately suspect her of murder. 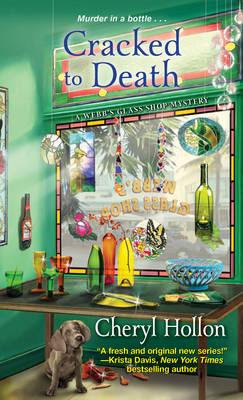 To keep from appearing before a judge herself, Savannah sorts through the broken pieces of glass scattered around the victim for clues as to who took this killer competition too far "
Fans of this series will not have to wait long as Cracked to Death is due out this June. Don't you love these covers. The puppy and the colors stand out perfectly in this cover! When a treasure hunt leads to deadly plunder, it's up to glass shop owner Savannah Webb and her trusty investigative posse to map out the true motives of a killer . . . It's the dog days of summer in St. Petersburg, Florida, and Webb's Glass Shop proprietor Savannah Webb has an eco-friendly plan to help locals escape the heat--a recyclable bottle-crafting workshop taught by reticent store manager Amanda Blake. Turns out, the class is a bigger smash than expected, thanks in part to a pair of staggeringly old bottles brought in by snorkeler Martin Lane . . . Linked to a storied pirate shipwreck, the relics definitely pique Savannah's interest. But intrigue turns to shock when Martin's lifeless body washes ashore the next morning, another glass artifact tucked in his dive bag. With cell phone records connecting Amanda to the drowning, Savannah must voyage through unchartered territory to exonerate her colleague and capture the twisted criminal behind Martin's death . . .
Click here to learn more about this up coming release! Well another busy week in come and gone and some lovely things have been on my table. My friend Daniela dropped off a hot chocolate complete with a chocolate marshmallow ball as I had to miss our tea date with two sick boys at home. 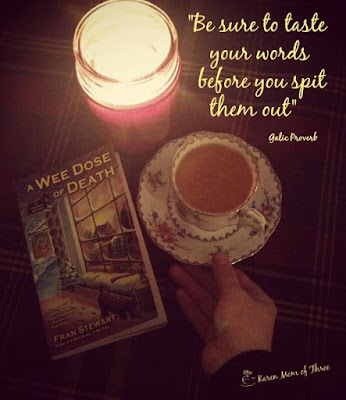 The mail man kindly stopped by with some books I had ordered and I spent most of Friday night reading Fran Stewart's A Wee Dose of Death. Along with books, my mail man brought me a surprise treat from my friend Karen in Toronto, I felt very blessed to have so many thoughtful friends. 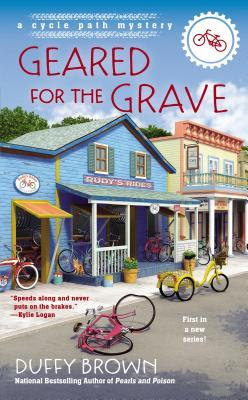 I read a few stories this week and Geared for the Grave by Duffy Brown was a delightful surprise, I have never wanted to "high-five" a main character as much as I did at the end of Geared for the Grave. 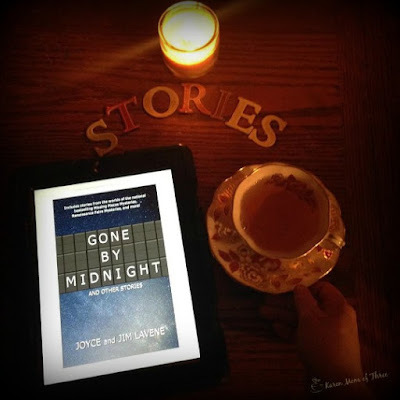 Gone by Midnight is an eclectic collection of Joyce and Jim Lavene's short stories. 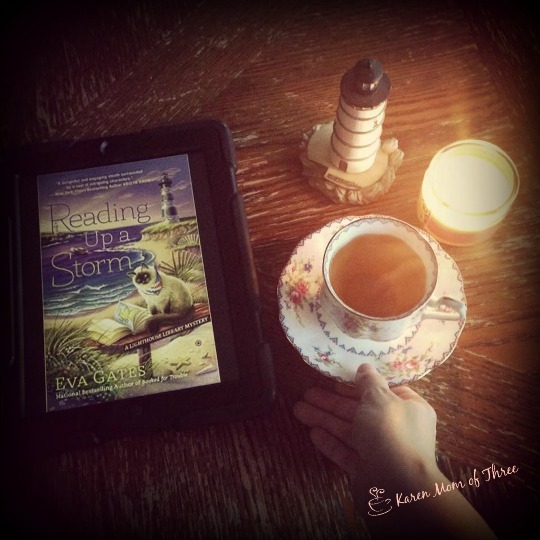 Reading up a Storm by Eva Gates was a wonderful weekend escape, I do love books with lighthouses in one and in Eva Gates book the lighthouse really is a character all on its own. 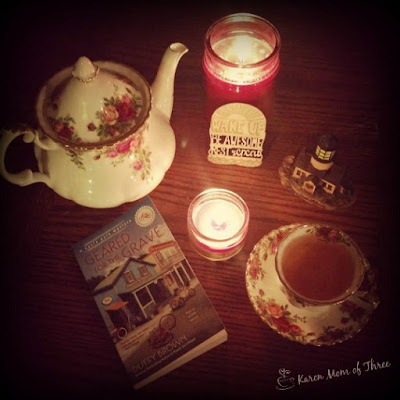 Duffy Brown's Geared For The Grave, A Cycle Path Mystery Was Outstanding! I closed Geared for the Grave by Duffy Brown with the hugest smile on my face. This book was outstanding. 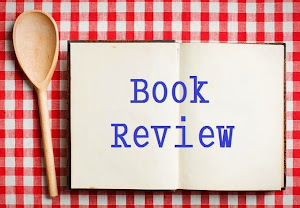 I ordered this book after receiving my Christmas Cookie Recipe Book that Duffy Put together over the Christmas holidays and with it she included info about this book and series which I had not heard about. I read the write up on the series and ordered a copy of Geared for the Grave from The Book Depository. It arrived on Wednesday and it was so much better then the write up! Mackinac Island is a peaceful summer resort town where everyone coasts through the streets on bicycles. 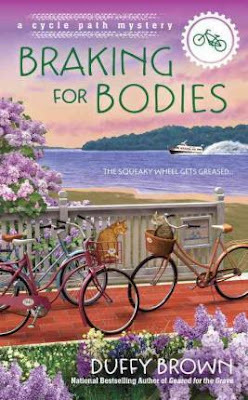 But after someone sends a prominent local on her final ride, it s up to one resourceful visitor to get things running again Hoping to shift her chances of a promotion in her favor, Evie Bloomfield heads to Mackinac Island to assist her boss s father. Rudy Randolph has broken his leg and operating his bike shop, Rudy s Rides, is too much to handle by himself. But Evie s good turn only leads to more trouble After Evie s arrival, wealthy resident Bunny Harrington dies in what looks like a freak bike accident. Upon closer inspection, Bunny s brakes were tampered with, and now the prime suspect in her murder is also Bunny s number one enemy: Rudy. So if Evie hopes to stay on her boss s good side, she ll need to steer Rudy clear of jail. 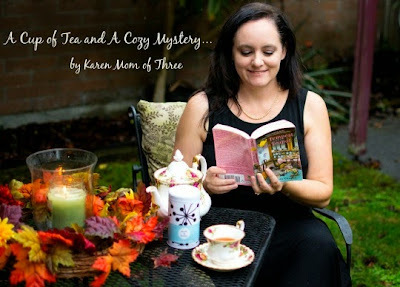 Now she must quickly solve this mystery so she can put the brakes on the real killer s plan "
I absolutely adore the cover, it is a bright and lively as I found the story and made it so easy to picture this island retreat! I enjoyed this story with some Black Forest Cupcake Tea by Four O'Clock that is a delightful treat. 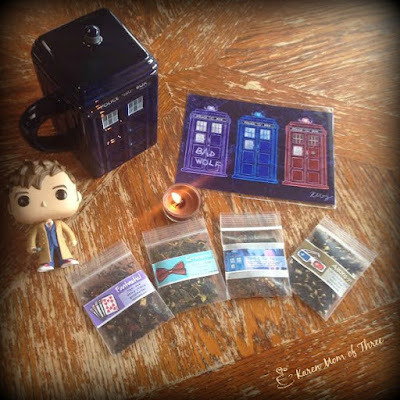 It is a roust black tea with hints of cherry and the sweetness of a cupcake and all that with out me even adding a drop of sugar! 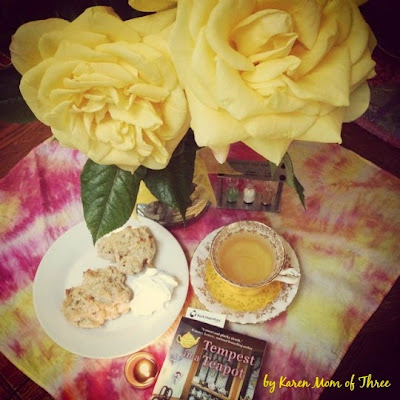 It was a lovely tea time treat, no cookie required but I ate three anyway. In Need Of A Bookmark Pattern? Yesterday my paper back order of Geared for the Grave by Duffy arrived and when I order from The Book Depository there is always a cardboard bookmark with the order but some how mine got missed. 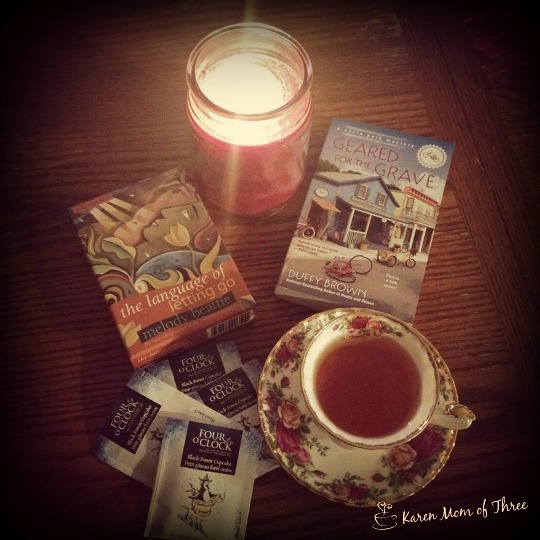 So I was thinking about bookmarks and it leads me to today's post. I am not good with a hook but I know some of you are and with Valentines day just around the corner take a look at this free pattern by clicking here. I was sent Gone By Midnight a selection of short stories by Joyce and Jim Lavene to read and review. 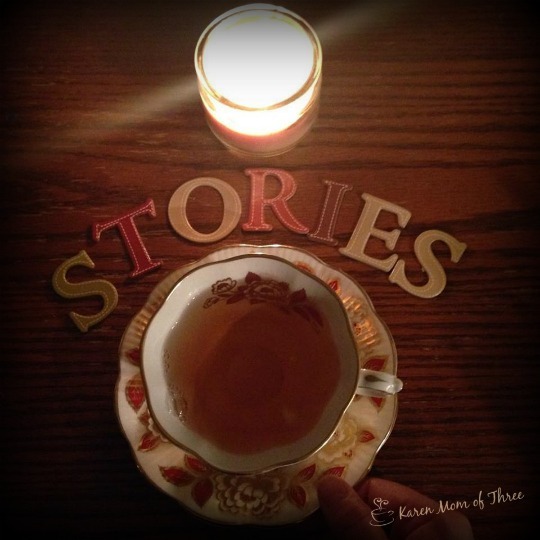 This is a very eclectic assortment of short stories that I found refreshing and delightful. The first story Aunt Edna, drew me in, sat me down and served me a warm and fuzzy feeling, delighted my senses and had me longing for Apple Pie and the soft surf of the ocean. I love how a well written story can change your mind, attitude and outlook. Fans of Joyce and Jim Lavene will thrill at this collection of thirteen short stories—many are set in the worlds of their national bestselling mystery series, including the Missing Pieces Mysteries, the Renaissance Faire Mysteries, the Retired Witches Mysteries, and an upcoming mystery novel! 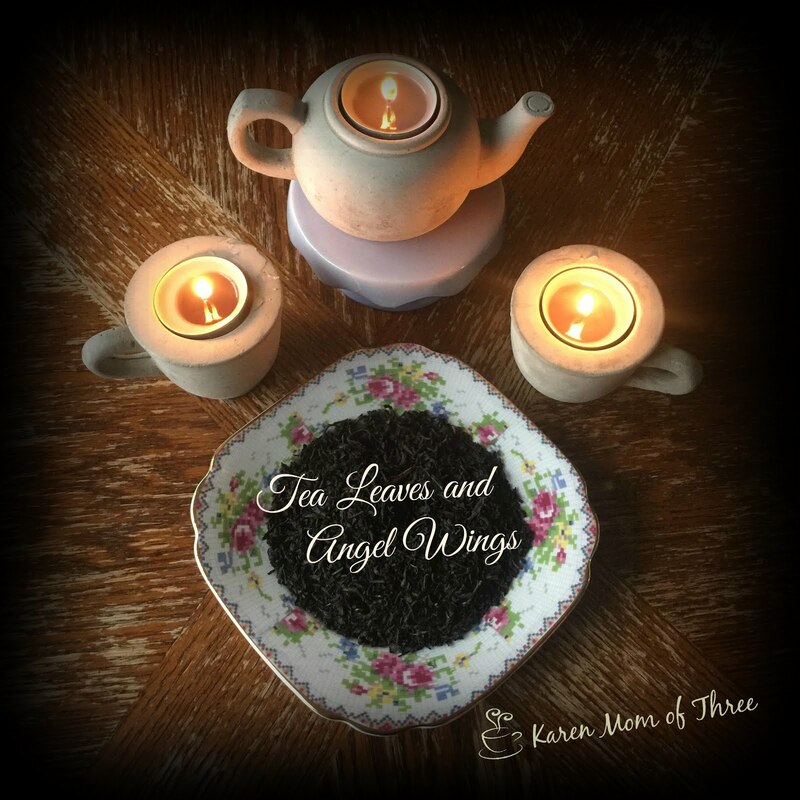 These stories contain the elements of mystery and fantasy the Lavenes are famous for, as well as some new things their readers have never seen. Several stories feature characters interacting with ghosts, magic, and the supernatural—the healing woman in “Courtship;” the Civil War widow in “One with the Darkness;” the city girl who summons a wizard from the past in “The Magician and the Sorceress/Accountant;” and the young introvert in “Aunt Edna” who finds her calling with help from a ghostly visitor. Poignant, charming, and captivating, Joyce and Jim Lavene bring their characteristic wit and heart to these stories and introduce each one with a passage about its origin or how it ties into the universe they’ve created. Gone by Midnight is a treasury of tales that will delight the mind and touch the heart from one of the most prolific writing duos of our time. 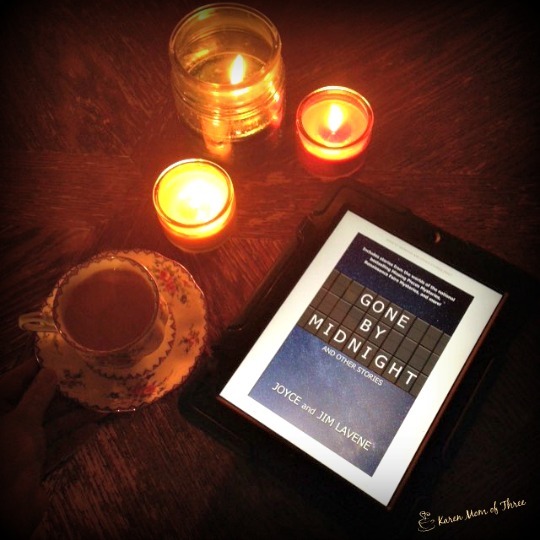 Gone by Midnight is out February 2nd and you can pre order your copy to arrive on your Kindle by clicking here. I am serious about the series I love and waiting on my favorites is never easy, nor is it easy to wait to share books I have had the pleasure of contributing too. 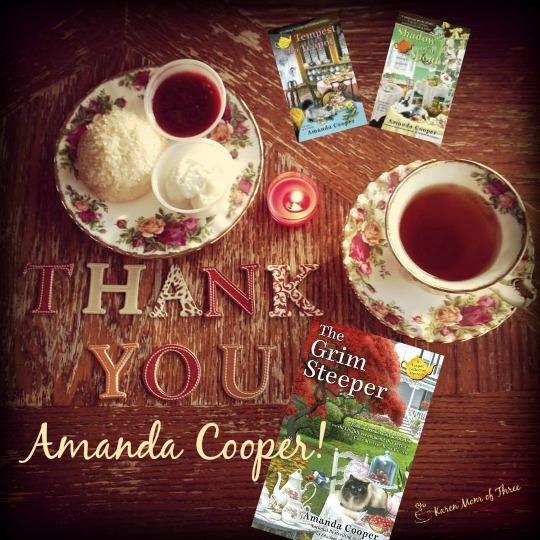 The Grim Steeper by Amanda Cooper is out at February 2nd and I am anxiously counting down the days until it arrives at my door. I pre ordered it, I did, for those of you who may think I get my books for free please know that this is not the case. I am very lucky to be selected to get advanced reading copies of a few books a year but most of the time I am the one pre ordering and paying for the books I want to read, as soon as I hear they are ready to pre order. Thought I am getting used to reading on my Ipad Kindle app, it is the paper back treasure that I long to hold in my hand and display as trophies on my shelf. 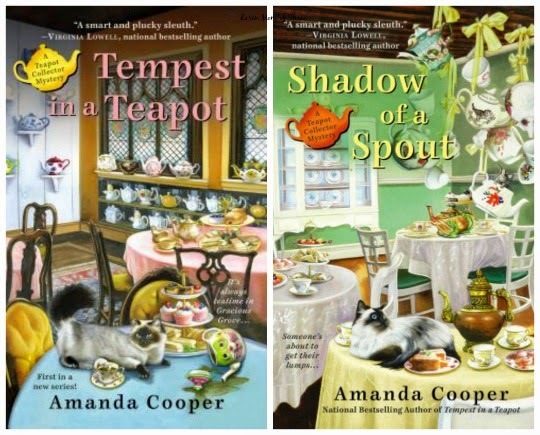 Amanda Cooper's Teapot Collector Series is one that I have found so exhilarating. When I heard of it's release for pre order and saw the cover I knew I found a series that I would love. I was so pleased when it arrived and it was everything I could have hoped for and more! I wrote to Amanda Cooper and let her know just how much I enjoyed reading Tempest in a Tea Pot and we connected over our love of all things tea. When Amanda was sending Shadow of a Spout to print she asked me if I would write something to be included in the back of the book and I was so delighted to be asked. 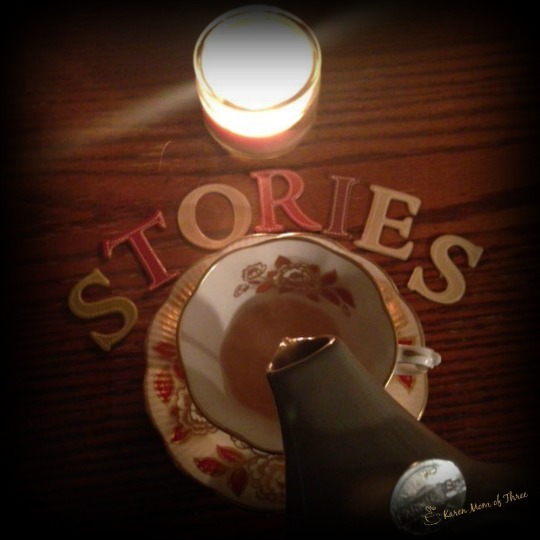 I wrote an introduction to tea which can be found in the last few pages of Shadow of a Spout. It was a very proud moment for me. Now with the up coming release of The Grim Steeper I am thrilled to have been asked to add some information to the end of this book as well! 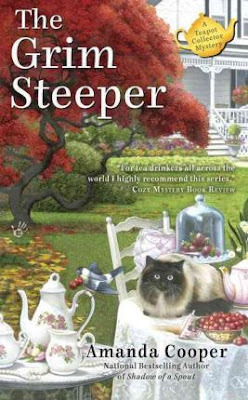 To see The Grim Steeper in print and with my own name in it is such a thrill and a privilege! I can not wait to have it in my hands and see what happens next! 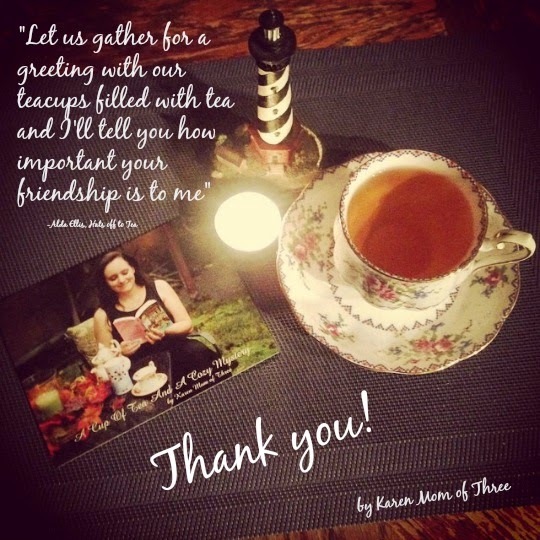 The national bestselling author of "Shadow of a Spout" invites readers back to the Finger Lakes town of Gracious Grove for more tea and murder... Mid-October in the charming Finger Lakes town of Gracious Grove means it s time for the annual Fall Fling Townwide Tea Party. The highlight of the festivities is a roaming tea-tasting, which includes a stop at Auntie Rose s Victorian Tea House. Sophie Taylor would like to share her enjoyment of the event with her sort-of boyfriend, English teacher Jason Murphy, but Jason s dean has accused him of falsifying grades to help an athlete at the local college. Steamed and stressed, Jason shows up the night of the party with bags under his eyes. But the dean shows up under Sophie s Japanese Maple later that night, murdered, and now Jason is suspected of far worse than fudging grade reports. 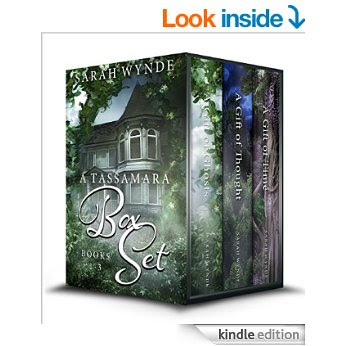 It s up to Sophie, her Nana, and their friends the Silver Spouts to pore over the clues to find out who really decided to teach the dean a lesson." I can not wait for March to arrive and the release of Amanda Coopers The Grim Steeper. I hope that you will pre order and read along with me! You can pre order from The Book Depository by Clicking here. I spent the weekend reading and thoroughly enjoying Eva Gate's Reading Up A Storm this weekend. Though truth be told we had only rain and not that massive Winter Storm our friends in the East got. I took every stolen opportunity to sit and read this very enchanting book about a lighthouse that is also a library. I adore the idea and this series. 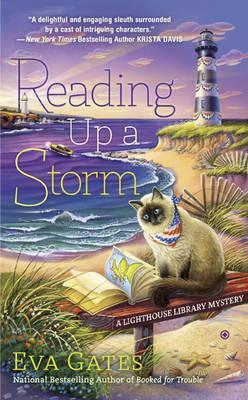 "Misfortune blows into North Carolina s Outer Banks when a dead body in a boat on the shore leaves local librarian Lucy Richardson racing to solve a strange new mystery...." After a successful party at Bodie Island s Lighthouse Library, librarian Lucy Richardson is ready to curl up with her cat, Charles, and a good book. But her R and R is cut short when she notices some mysterious lights leading a small boat to crash into the coast. The two shipwrecked seafarers survive the ordeal but one of them shows up dead ashore a few days later. Lucy finds herself again roped into a murder investigation and navigating a sea of suspects, all of whom had motives to deep-six the deceased. And this time, she has a sinking feeling that finding the real killer won t be so easy..."
As covers go this one is a fantastic one. When I first saw the cover art for Book or By Crook, it was the cover that made me order it and I am so glad I did, the cover art is important to me and it really does set the scene in this series. I can imagine where Lucy's Apartment sits, the patrons in the library, the reading club areas and the lovely library cat. In 72 more days you yourself will see what I mean about Reading Up a Storm. I found myself captivated by the story and even as it unfolded I was amazed at the twists and turns the mystery took, who the killer was, was not even on my radar until the very end. I hope this series becomes more then just a trilogy as I felt like I was only just getting re acquainted with my old friends as the story comes to a close. I really loved and appreciated this story, for the way it took me away and the emotions it evoked. I also can not help but imagine what it would be like to live in a light house, something I always wanted to do since I was a very young girl. I have a small collection of little lighthouses to keep me company while I enjoy the very thought. 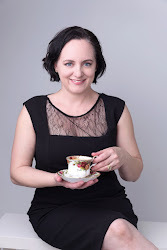 Imagine the tea parties and weddings I could host....but that is a story for another time. 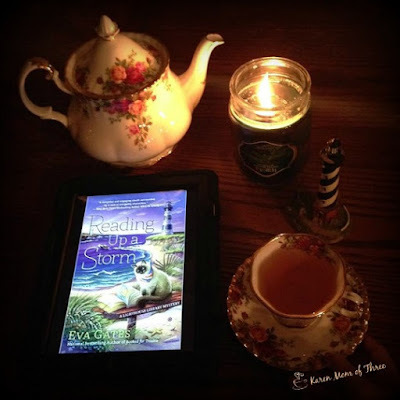 Pre Order Reading Up A Storm from the Book Depository by clicking here. or on Amazon for Kindle by clicking here. 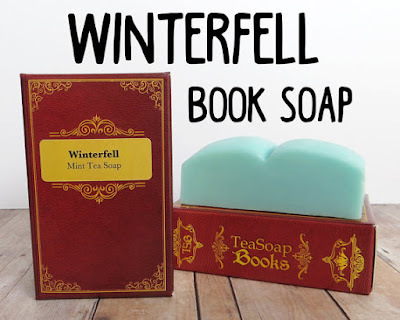 Tea Soap Books -A shop I hope you will love! I truly hope that you are all safe and sound this Sunday morning. I know that many of you are having a snow day today and I am a tiny bit jealous, okay a lot jealous of the beautiful white snow photos I keep seeing in my news feed. 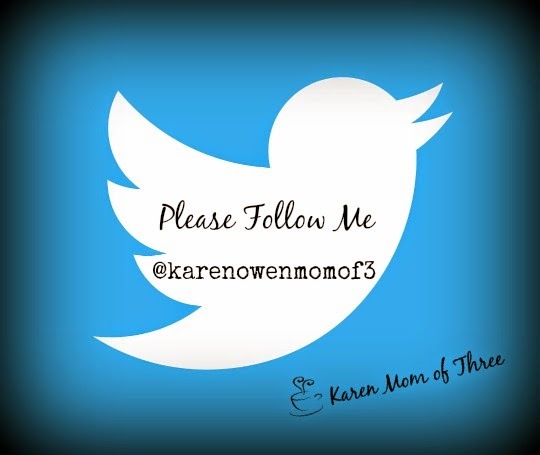 Today I am sharing a fun Etsy shop that I hope you will just love. Tea Soap Books combines many of my most favorite past times and makes a pretty cool product for people like us. 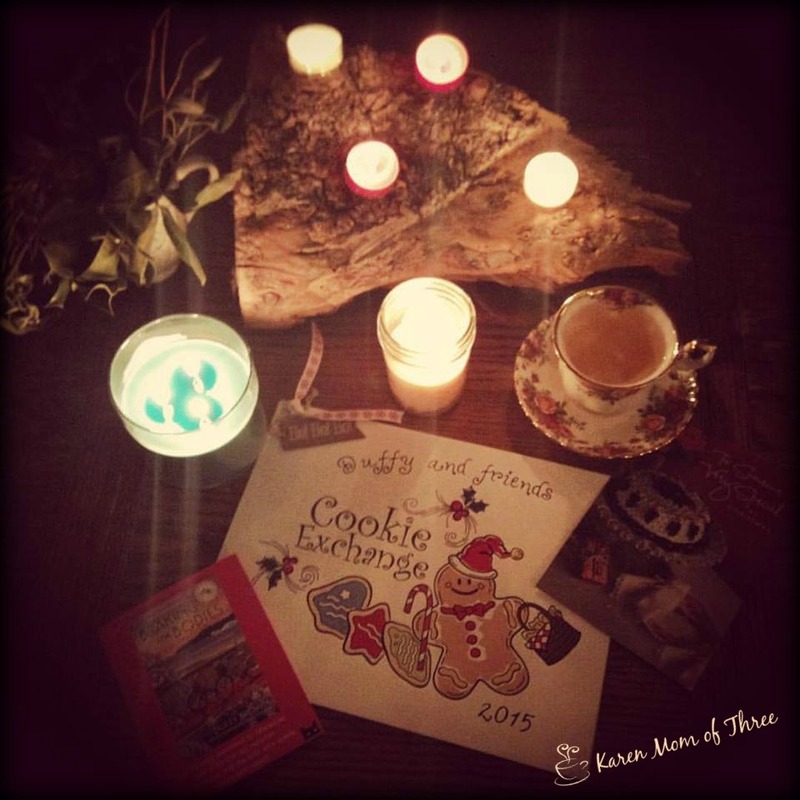 I have picked out my favorites and I know you will find something to love in this shop. There are more then 45 literary themed soap and bath teas that are infused with tea and shaped like books and library bags. I think this shop is darling! 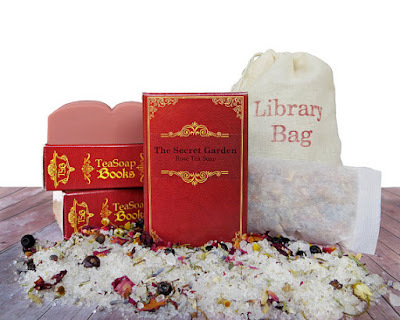 Priced $8.35-$30.00 this is a fun way to surprise or treat the tea and book loving person in your life. 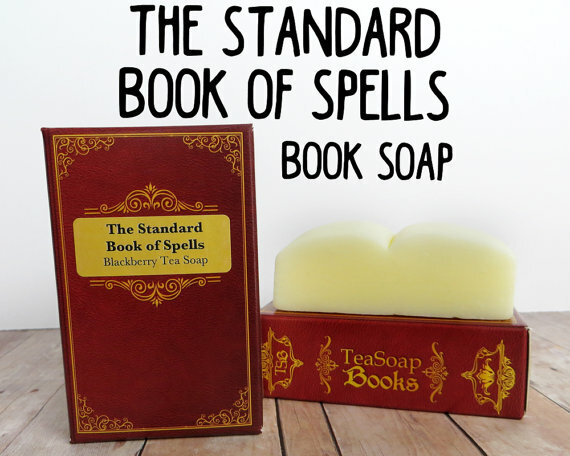 Click here to visit Tea Soap Books. 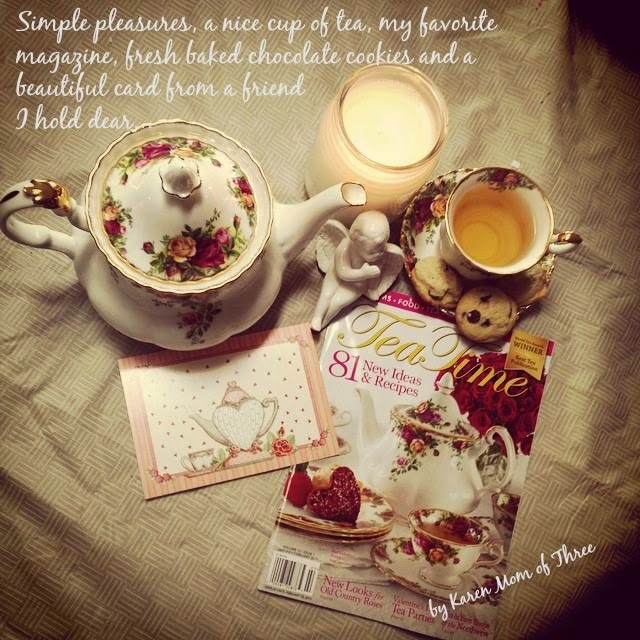 What a week and such a treat to have made the time to read and review some lovely cozies this week. A Gift of Ghosts was spectacular and I can not wait to read the rest of the trilogy. This story stayed with me most of the week and I found myself wondering about the characters and spirits in the book as if they were real people in real time, I love to daydream about what happens next. I got the next two books so I wont have to wonder long. 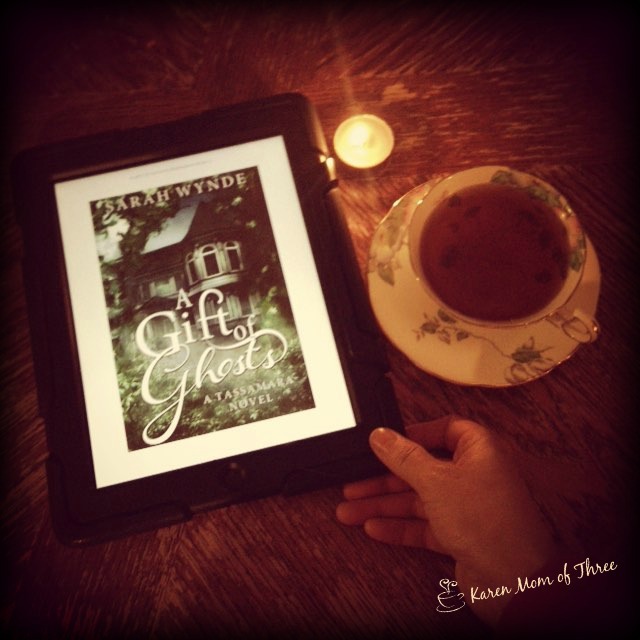 You can find A Gift of Ghosts by Sarah Wynde for your kindle app by clicking here. 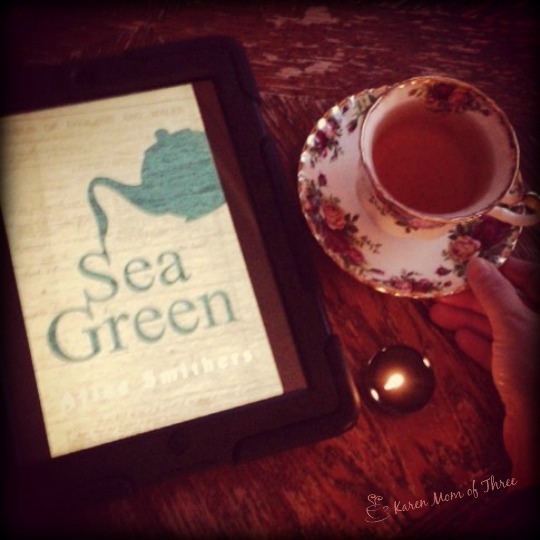 A Sunday Romance I read was Sea Green by Alice Smithers, A lovely cozy romance, British and full of fun this was a lovely change for me. A mid week escape to Ireland with Murder in an Irish Village is just what I needed. 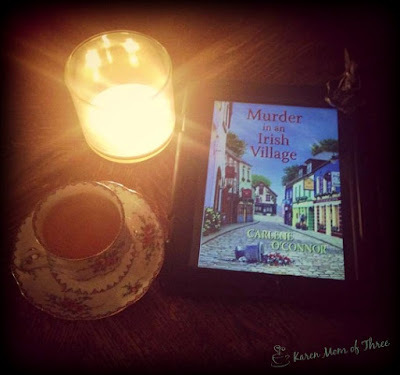 I had so many things I loved about this upcoming cozy by Carlene O'Connor, easy to relate to and characters you too will just love, I highly recommend this Irish Cozy! 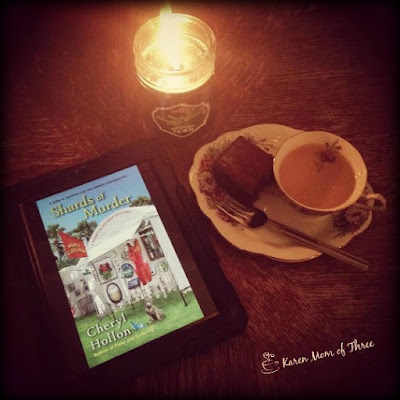 Rounding out the week with Cheryl Hollon's Shards of Murder that I started Thursday. I hope to have this review for you very soon. New themed teas in my cup this week with Doctor Who inspired teas, I enjoyed these new blends in my cup and my new Tardis Mug. It was a nice change for my afternoon teas this week. Cake for breakfast this morning and a spot of Heavenly Creme Tea too. This morning I am thinking of two wonderful lighthouse series and this one is a particular favorite. Eva Gates has A Lighthouse Library Mystery series that is such a delight. The third one is out this April this is book three and I so hope that this series continues! Click here to order Reading Up A Storm. 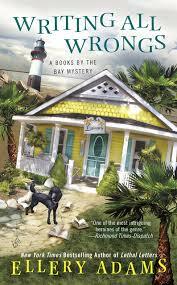 Ellery Adams Books by the Bay Mystery Series is another great lighthouse themed series. I still would love the opportunity to stay in a lighthouse or even own one. The history they hold with in their walls the stories they must have. There is a place in Oregon I would love to go for a retreat one day and so many more I would love to see and stand at the foot of. 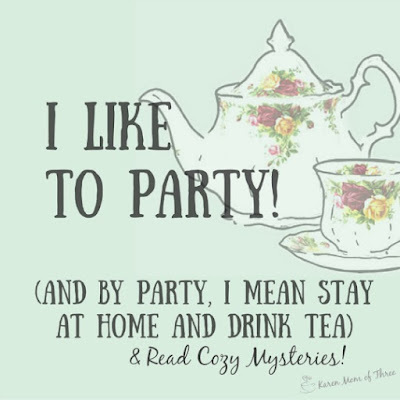 If you know of any Lighthouse Cozy Mysteries I should know about do please share them with me here. I am looking forward to reading Reading Up A Storm only 76 more days until it is released! 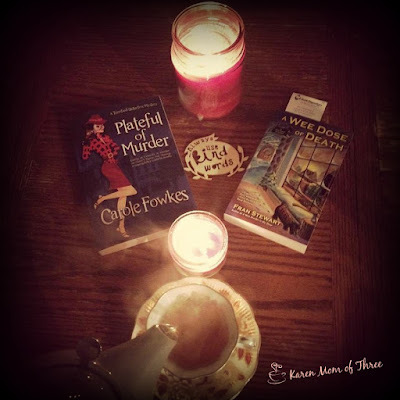 Guilty As Cinnamon A Palate Pleasing Whodunit!